This restaurant is located on the water side of the cliffs road. Welcome to Negril and welcome to 3 Dives! 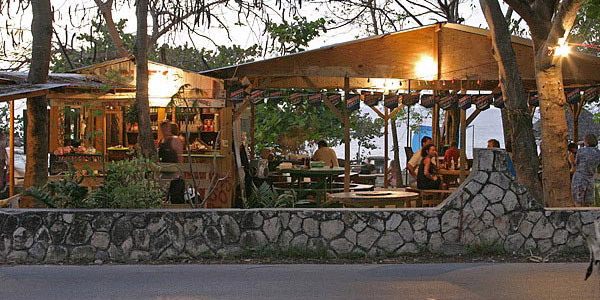 Up on the west end of Negril, Jamaica (an area also known as "the cliffs") is one of the secret gems of Jamaica - 3 Dives restaurant and bar. There are two bars, one by the restaurant and one by the cliffside. Most visitors come for a leisurely evening of drinks, a great view of the setting sun and a great dinner, it makes a very nice change of pace from the hordes of tourists found elsewhere...many stay to enjoy a nighttime bonfire and music. Some come by for lunch (in season) and a climb into our cave or a jump off our cliff. What everyone comes back for is the great food and the warm hospitality of the owner-chefs, Lydie and Paula. 3 Dives is not a fancy place nor is it a place for a quick meal...it's a real place, and a must-do in Negril and not in a rush. Stop by and see us next time you're here! Isn't it time for you to experience true Jamaican hospitality and food on the cliffs of Negril? 3 Dives is open for dinner and sunset year round, also for lunch in high season. Need to make contact? Call Lydie at 876-782-9990 or 876-344-6850. You can also find them on Facebook. 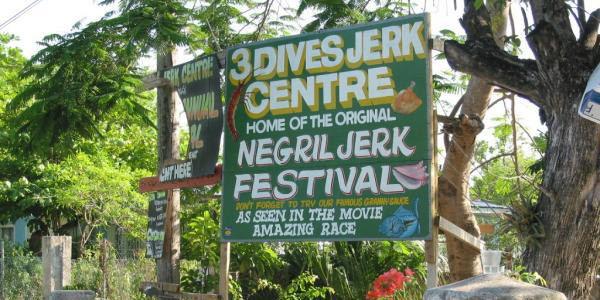 3 Dives jerk centre is one of the top jerk centers in Negril. When you visit Negril, make sure you stop in, located on the west end cliffs, a short ride from the beach and Norman Manley Boulevard. It’s no small tribute to 3 Dives that its jerk overshadows its reputation for lengthy waits (sometimes over an hour). Fortunately, the chefs are more than happy to let you peek into the kitchen, where there’s bound to be a pile of super-hot Scotch bonnet peppers threatening to spontaneously combust, and you can sip cheap Red Stripe on the cliffs at the end of a small garden. This is also the site of the annual Negril Jerk Festival. Read more.